It is difficult to find food in the dark. But the splitfin flashlight fish Anomalops katoptron has no problem: it turns its headlights on when it hunts on zooplankton, as Jens Hellinger and colleagues report. Only in complete darkness, the splitfin flashlight fish Anomalops katoptron will leave its hiding place. During daytime the fish, which lives in shallow coral reefs in the Pacific, resides in cavities and cracks in the reef where it is invisible to its predators, thanks to its dark colour. But in dark moonless nights it ventures to the open water to forage in a school of conspecifics. The diet consists of swimming zooplankton, prey that is difficult to find in the dark. But Anomalops katoptron has a light organ under each eye that emits blue light, Jens Hellinger and colleagues point out. 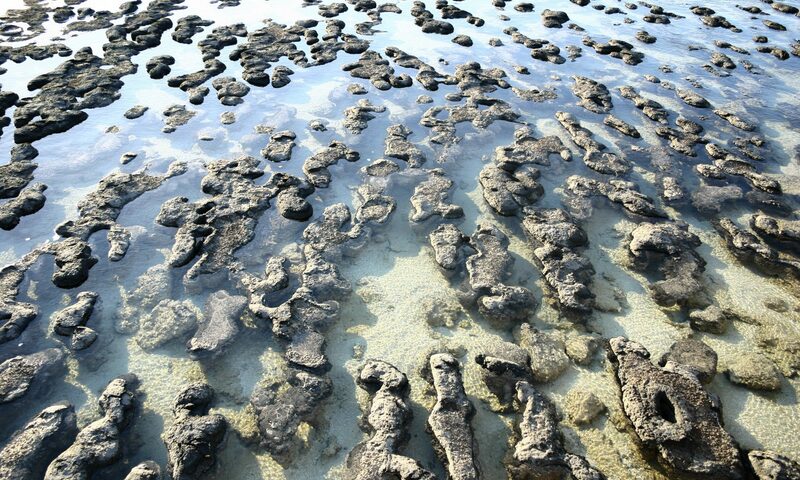 The light is produced by symbiotic bacteria that live densely packed within these organs. The bacteria have got a safe place to live in, in exchange for producing light. The bacteria glow continuously, but the fish can turn his lights off by rotating them, exposing their dark backsides instead of the transparent sides. During the day, the lights are almost always off, otherwise the fish would be visible in spite of its dark colour. Occasionally, he blinks. 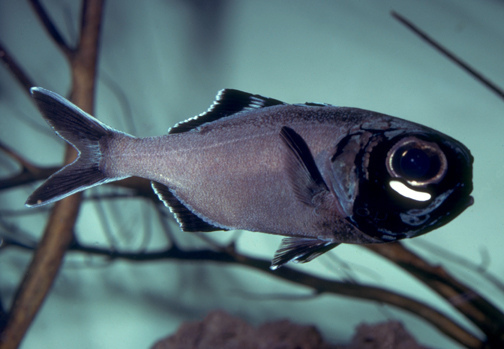 When the splitfin flashlight fish is active, at night, he blinks more often, Hellinger observed when he studied a number of fish in a tank in the laboratory, and the lights shine about half of the time. And if the fish detects prey, it has its lights on almost continuously. Many animal species exist that emit light, particularly in the sea, and their luminescence has several functions. Most luminescent species emit light to chase off or embarrass predators. Anglerfish lure prey: their dorsal fin is modified to a ‘fishing rod’ with a luminous bulb that attracts little creatures. And still others lure or recognize partners by flashing patterns; male ostracods, for instance, perform a spectacular light show to attract females, much like fireflies do on land. Until now, it was not clear where the splitfin flashlight fish Anomalops katoptron uses its light for. It now turns out that it is mainly to detect prey in the dark.